Watch Out for the Holiday Blues in Your Business! As I write this, there’s still another couple of weeks of the school holidays left, plus the following few weeks when there will still be many going on holiday. However, despite this ‘holiday season’ coming around every year, a vast majority of businesses have their daily operations severely disrupted, and often even put at risk, simply because they haven’t thought ahead and carried out a little planning and management. Plan ahead to avoid payment delays. Remember that when staff are away, customers will be too. So managing your cashflow is critical. Ensure supplier invoices are paid on time or you could damage your credit rating and limit your access to supplies on credit. Make sure enough authorised signatories for BACS payments are still at work throughout the holiday period. The same applies with cheque signatories (if you still use them). Make sure that staff complete a proper handover, and in good time, to cover their holiday absence. Particularly ensure those involved in raising sales invoices and chasing customers payments must properly brief the staff standing in for them; especially on any payment commitments already made by customers. They must also be aware how to follow up customer invoice queries so that disputes are resolved quickly. Make sure that suppliers and customers are aware of any alternative holiday period contacts to ensure a smooth handover, and ensure those standing-in have access to a list of supplier and customer contact details. Make sure recording and forecasting cash flow is maintained maintained if accunting staff are away. Debrief people on their return to ensure they’re back up to speed as soon as possible. To see all headline articles from previous editions of my b³ newlsetter, please click here. 1) They don’t like being with large groups of people. WRONG! On the whole, introverts are as much ‘people people’ as extroverts. They are quite happy to be among large groups of people. The key difference is that introverts tend to chat with one or two people at a time, and tend to do more of the listening and less of the talking. Introverts generally aren’t big fans of ‘small talk’, and tend to only speak when they have something valuable to say. The upside of making the effort to get to know them? They make very loyal, reliable and trustworthy friends who are often great sources of advice, guidance and knowledge, as well as exceptional listeners who have a broad and deep understanding of people. 2) Introverts don’t like public speaking. WRONG! Some of the best public speakers I know are introverts. Contrary to popular belief, introverts are often quite happy to stand up in front of, frequently, hundreds of people and give exceptional talks or presentations that are insightful, informative and funny too. Introverts also tend to develop good reputations as speakers and as ‘experts’ in their chosen fields. 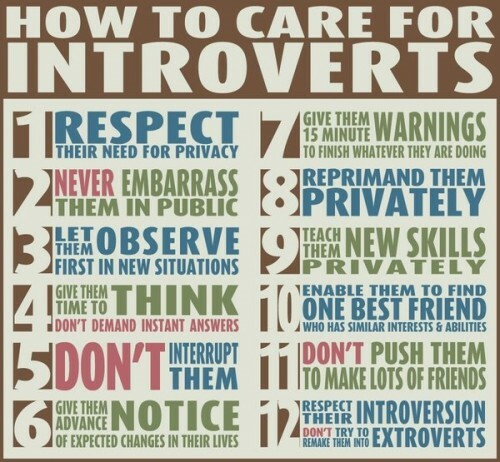 3) Introverts are reclusive, distant and difficult to get to know. WRONG! If you’re finding this is the case, just start engaging them in a different way, and start asking the right questions! 4) They tend to be ‘geeks’. WRONG! Careful and considered in their judgements? Almost always! 5) They don’t make good leaders. WRONG! Introverts make exceptional leaders (see above!). They instinctively make well thought through, well balanced, and highly respected decisions because they have a thirst for knowledge and for doing things ‘right’. As such, they quickly earn the enduring respect and loyalty of those around them, and introvert led teams, businesses and other organisations tend to be among the best in delivering the highest levels of customer satisfaction, and employee satisfaction too. 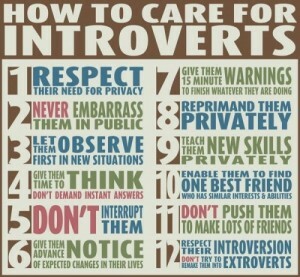 Remember introverts actually deeply enjoy being with people. They just tend to do it a little less than extroverts, and seek peaceful environments in which to ‘recharge their batteries’ (which does not necessarily mean time alone). To return to my main website, please click here. If you work anywhere near the fields of coaching and mentoring, or even if you just have a passing interest in them, then you probably appreciate the importance of not just facilitating developing your client’s thinking, but also your own. Here are five books that have had interesting influences on my own thinking – and they’re not necessarily about thinking! If you decide to give any of these a go, please let me know what you think. As always, this is just a list of some of the books that have helped my thinking – there are many, many others, and if you have any favourites, please feel free to add them through the comments box below. Wikinomics – Don Tapscott, Anthony D. Williams, in this social media world, this helps us to consider and understand the influence and changes that mass collaboration can have. Positive Thinking – It’s Easy! Really! I bang on and on about it, don’t I? People who know me will no doubt agree, and be rolling their eyes skywards! Yes, I’m often heard extolling the virtues of positive thinking. But does it really work? Or is it mumbo-jumbo? How many people do you know who take a positive attitude towards everything, or at least almost everything, they do? How often do they succeed in whatever they set out to do? Have you noticed that whether they succeed or fail, they rarely become negative or indecisive or ‘down’ – or, if they do, it isn’t for long? How many successful people do you know, or know of? How many of these show that they think positively? How much do they all seem to enjoy life? Positive thinking really does make a substantial contribution to how people conduct themselves, the decisions they make, and the way their lives turn out. Surely it’s not just about ‘thinking’, is it? Thankfully, successful positive thinking is actually quite simple and takes just enough effort to change your thinking habits – it really is that easy! That’s all! Firstly, let’s explain how it works…. If you have something you want or need to do, what is your attitude towards doing it? Good/positive/enthusiastic, or poor/negative/can’t be bothered/I’ll do it later? Don’t worry, we all have our good days and not-so-good days! When you set yourself a target, whatever it is, and however much you’re interested in it (or not! ), you’re actually starting up the opportunity for your own positive thinking. How you choose to move forward from there is the simple key to a successful and satisfying outcome. Even better, if you really, genuinely, completely ‘buy in’ to achieving a target, you’re already moving forward. By being positive and committed towards something, you automatically start to change the way you think. The more positive/committed you are, the more substantial and, potentially, more permanent the change. Because your focus has moved to a particular target, you automatically start to change what you do, the decisions you make and the information and people you seek out to move closer to that target. The closer you get, the more you do it – simple! Importantly, the more you do it, the less effort it takes too! But the first step is to change your thinking habits. Try this exercise – for the next week, wear your watch on your other wrist. Next week change it back. The week after change it back again. After a few weeks, you’ll automatically look at whichever wrist has the watch on it automatically, and what you will have done is change your thinking. So, in terms of creating and keeping a positive pattern in your thinking, try changing your thinking habits by asking yourself a few simple questions whenever you have a target to meet. What will it be like as you take the steps towards your target? Visualise this in as much detail as you can : How you will feel? What sights, sounds and smells will be part of getting there? What other people might think or say (if that’s important to you)? How will you feel when you achieve the target? Be as detailed as you can – take particular note of all of the elements that energise you and return to these regularly, and especially important when you get moments of poor motivation. Identify key milestones along the way – this is easier for bigger/more time consuming targets, but the principle is always the same – and give yourself a pat on the back for achieving each and every one. Once you have been through this a few times, your thinking will automatically sort it all out for you without you having to think it through as a conscious effort. Keep your thinking positive, understand where you’re going and what you’re aiming to achieve, and before long, no matter what those around you or the good old British weather is like, you’ll feel happier and achieve more – you may well even be healthier too! Above all, remember that this is a choice. To make your thinking more positive, achieve more, and enjoy your life more…….or not! How many organisations, especially the ones we all have to deal with (e.g. : utilities, local councils, etc), just can’t wait to tell us how good their customer service is? Or should that be how good they think their customer service is? In reality, just how good is it? Achieveing genuine execellence in the field of customer service is only as difficult as you want to make it. It may be an old, and well-worn adage, but little things really do make the difference. Solid, simple, clear thinking is also vital to success – one of the easiest things to do, and yet is so often not done! Remember K.I.S.S.? Keep It Simple (Stupid)! Within the last few weeks, an associate and I have been spurred on to create a new attitudes, behaviours and skills development programme simply called ‘Customer Connected’ – driven by our collective, and frequent poor experiences, as customers, when dealing with all sorts of organisations. A year ago, I signed up for the best dual fuel energy deal I could find. At the time, the well known energy provider made it quite clear that the deal would expire on 31 July 2010. Fair enough. Last week, I received a letter from said energy provider reminding me that my current deal was about to expire – thanks for the reminder, well done. The same letter also advised me that my supply of gas and electricity was being moved to their standard, most expensive tariff – no details of what other deals are available whatsoever! Bad move on the customer service front! Very bad! Important: the energy provider failed the simplicity test – as one deal runs out, letting the customer know of the best deal they can provide, rather than the worst deal they can provide, takes exactly the same amount of effort. So, I checked the energy provider’s website, only to find that there is a much better deal available (which actually turns out to be the best deal for me, whatever the provider) – by this time I, as a customer, am becoming increasingly unimpressed! The website only allows new customers to sign up for the deal – the implication here is that it isn’t available to existing customers. At this point, that little voice in my head says, “Well, we’ll just have to see about that, won’t we?”. By now, again as a customer, I’m pretty miffed to put it mildly! So I grab the phone. After 3 minutes of being bounced around in a telephonic abyss, I eventually get to speak to a real human being. Well, when I say ‘real’….! To cut this story short, it turns out that the ‘best’ deal is actually available to existing customers too!!! Great. Why doesn’t your website and your letter say that? Another addition to my poor customer experience! Can it be organised there and then? Yes. Great! At last! So, what infathomable reasons are there for me being forced to experience these instances of poor customer service when providing all of the information in the letter would have made me a happy customer straightaway? Goodness knows what the real answers are to that question, but, in essence, they missed a major opportunity to deliver great service. Somebody, somewhere in that organisation approved the letter, designed the website, purchased and configured the telephone system, and employed the myriad of customer ‘service’ personnel – all of which costs (more) money! Or, to put it another way, adds cost to the business. These costs have to be recovered through the (higher) charges to customers. The lesson from all this? Whatever the amount your customer spends with you, however much interaction you have with them, and however valuable they are to you and your business, keeping them happy really isn’t that difficult! For some reason, there has become a desire to take something simple and make it as complicated as we possibly can. If you really value keeping your customers happy – please, please, please don’t do it! Having A Strategy – Yes, It Really Is THAT Important! Lots of people talk about it, lots of people are interested in it, and lots of people profess to have one. UK government figures show that 80% of new businesses fail in the first 5 years of trading. From our own experience and research, 95%+ of these businesses don’t have a developed, fully understood strategy! Even more interestingly, of the businesses that survive beyond their 5th birthday, we found that over 90% have an established, well understood and well communicated strategy that is formally reviewed at least every 6 months. So, what links business success and having a clear strategy? As is so often the case, it’s mostly about clear thinking. Whenever you decide to do something, how often, however briefly, do you imagine what it’s like to complete it? How it will feel, what it will look like, what actions you will take to complete it, what others might say or think, or what sounds or smells may be associated with your achievement? Well, in many respects, what you’re actually doing is forming a modest strategy. Probably the most important reason for developing a clear, detailed and well thought out, and achievable strategy is because of how it helps give you and your business clear direction. It provides a focus for all of the effort taking place within the business – much in the same way as you create your own focus when you decide to do something. Don’t get me wrong, a strategy isn’t, nor should be, set in stone – in fact very few last more than a year without some amendments. What causes so many businesses to miss out on having a strategy then? This isn’t so easy to establish – the main issues are that some cite a lack of time (you’ll have plenty of time if your business doesn’t make it! ), some that that they don’t understand how to put together a strategy (you don’t have to! ), some that it involves too many numbers (honestly! ), and some that they don’t see the point (yes, really!). Remember when you needed advice about your tax or accounts? Who did you go to? An Accountant? When you were ill, who did you go to? A Doctor? When your car needed servicing, who did you take it to? A Mechanic? My point is that when we need specialist help, we find that turning to someone who is a specialist in that field is usually the right thing to do. If we can find a specialist who’s got a fair bit of experience, or even comes with a recommendation from a friend or business contact, all the better. Also, when you have enlisted the help of a specialist, how valuable has it been to you and your business? That’s right – the amount they charge is often less than expected, and certainly considerably less than the value they provide to your business. Your success is in your own hands – but you don’t have to do it all on your own! 16th August, 2010: The very nature of Twitter, not least as it is already four years old, is that most word combinations have already been aired at some point – very, very, very little is likely to be genuinely new. So when I typed the hashtag #GlosBiz in a tweet around a week ago, it was hardly likely to be ground-breaking in the slightest. The term had just come about in my mind as a straighforward way of highlighting local business. My tweet went something like this, “If we all spend just £1 per week with a local #GlosBiz instead of a supermarket, imagine the difference it would make”. After a bit of reflection, I then followed it with (more or less), “Use the #GlosBiz tag to raise awareness of local business. Pls RT”. What happened next was, in my view, just one of those ‘right place, right time’ moments. Within hours, literally, the tag had spread across Gloucestershire and was being used by businesses of all sizes, customers of businesses, fans, even potential customers. Within 24 hours it had reached New York and was indexing on Google, and within 48 hours local PR people were picking it up, other ‘Biz’ tags had been created for other areas across the UK, and the whole idea of a Biz tag to highlight local businesses had taken on a life of its own. By now, one week on, there are many, many people using and watching the #GlosBiz tag, with many more tags being created. How the #GlosBiz tag took off, and the exact reasons for it could be, I’m sure, debated for hours on end. So there you are – a brief history of how a chance, random phrase turned into something with the potential to influence lots of people, lots of businesses, and hopefully improve all of their fortunes. If you know of a local/regional Biz tag in your area, please add it below to help creat a full list – thank you. I’ll add updates of how the tag is spreading as and when I can – in the meantime, if you’re a local business, or have any interest in local business, however spurious, in Gloucestershire, then please, please use the #GlosBiz tag in your tweets – it really can make a difference! As of late 2013, the #GlosBiz hashtag now reaches over 1 million people each week – for FREE! Ever noticed how sometimes, just sometimes, something takes off? And I mean really takes off? Such as Twitter or Foursquare or Hush Puppies or Sesame Street or Air Travel and so on, and on, and on? But what makes these, generally unlikely products or services ‘tip’ into a position of such popularity and success? What qualities brought about their dramatic rise to popular use and acceptance? Strangely enough, they really do all have some common characteristics. If ever you have read the classic book The Tipping Point by Malcolm Gladwell, you will already be making the connections. So, how can you apply this to your business? Of all the things that my business delivers, which one gets the most interest and is most talked about (by people outside the business)? How can I develop it to make it more appealing to more people? How, where and when could I test it to see how the development is going? What is my plan for letting the world know about it and how practical and achievable is that plan? That little lot should keep you busy for a while! However, if you’re interested in taking it further, let me know. Special thanks to Malcolm Gladwell and his excellent book ‘The Tipping Point’ for helping me work this out! © Adrian Malpass 2014-2017. All rights reserved. How many people attend regular ‘networking’ events, but struggle to get the best out of them? It would appear around 80% of these people are unsatisfied with what they get out of networking. Tell people what you do, not your job title – have an impact! You’re not an accountant – you help people pay less tax! You’re not an estate agent – you help people find their dream home! You’re not a web designer – you help businesses be more successful online! Where networking is concerned, it’s only as difficult as you want to make it. Give these easy tips a try, and let me know how you get on.